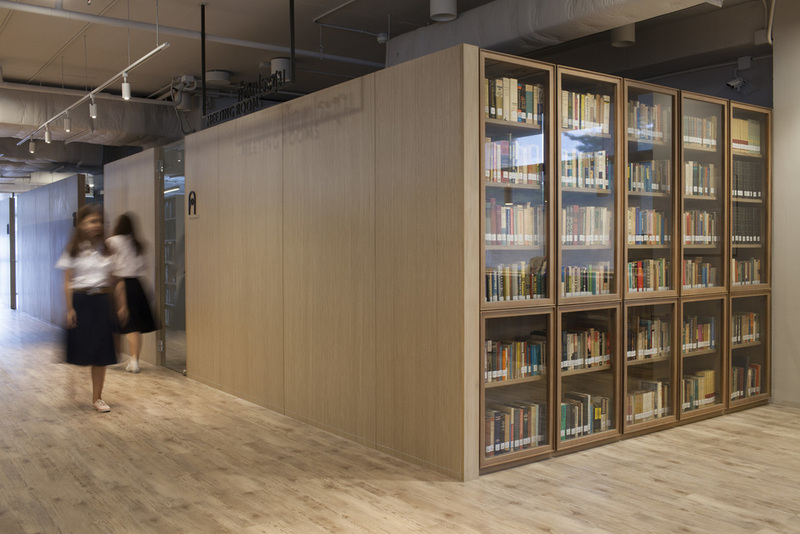 The new interior design for the library covers the entire 3rd and 4th floor of a newly constructed 13-storey building with an internal staircase connecting the two levels. The construction for the 3rd floor was completed within the same year of our design submission and the construction of the 4th floor is expected to begin in 2017. Each floor comes with two existing panoramic glass facades running the entire length of the building, with the north side overlooking the beautiful historic building with traditional clay roof tiles and the impressive line of majestic treetops, while the south side overlooks the Thai Red cross society and parking lot. As daylight or natural light plays a key role in the design and planning of the library. 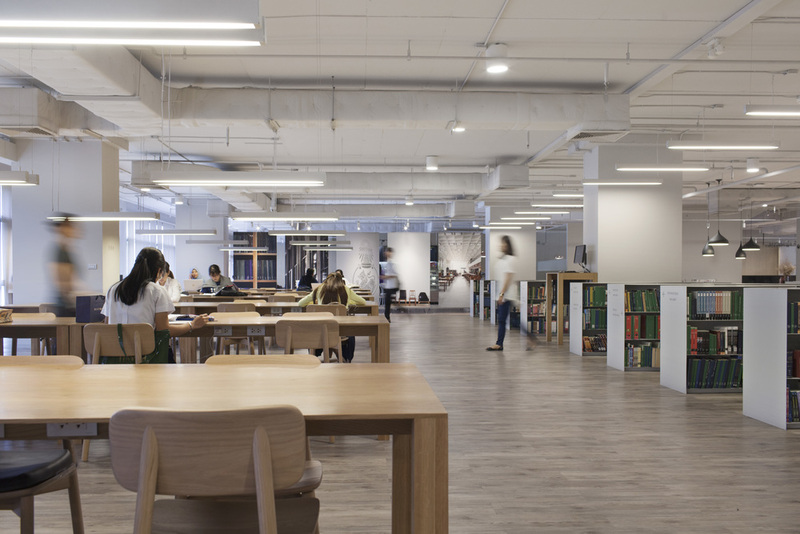 The main reading area finds its most appealing position along the north facade where for an extended amount of time, students can enjoy the soft and cool northern light with a lush scenic view. The main book stacks are placed in rows perpendicular to the south facade serving as a passive tool in filtering the heat and the strong sunlight flooding into space and directly onto the books. The meeting room partitions and book stacks are all pushed towards the perimeter of the building allowing for a large flow of open space in the central lounge and the reading area. The design also offers a number of intimate seating options in between rows of the main book stacks serving those students who are seeking a little more privacy. A special attention was directed towards the disable zone where it's easily accessible from the main entrance and in close proximity to the dedicated staff members. Special requirements for circulation and furniture dimension were carefully addressed to comply with universal design guidelines. The old library building and its historical compound was such a delight to wander around and stumbling upon old architectural elements, gracefully aged pieces of furniture and even the occasional sighting of the mythical Lion mascot (Singha), many other weird and wonderful oddities throughout, so much that a photographic documentation of these historic charms seemed like an inevitable process of our design. 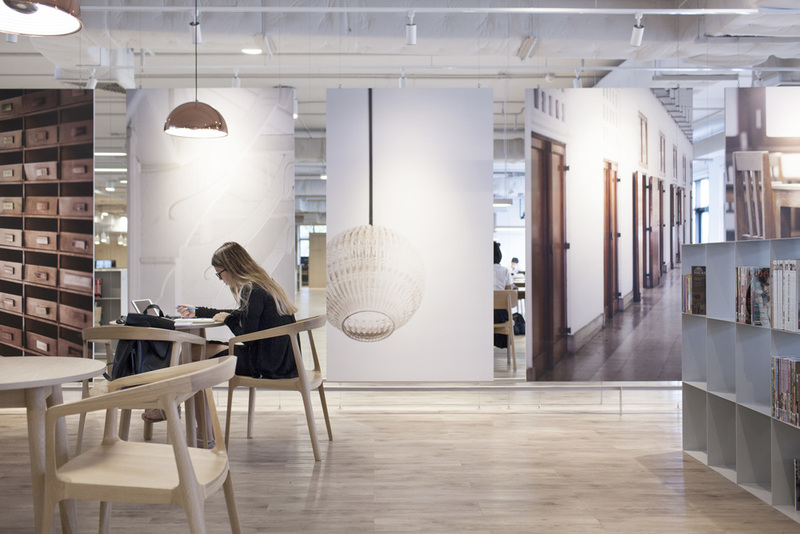 These photographs were then enlarged and celebrated as the main wall partition that defines the separation between the standard zone and the quiet zone, a prominent piece that can easily be seen from anywhere in the library.